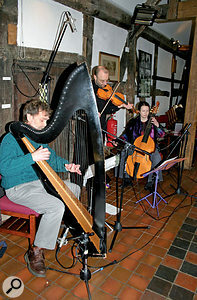 I was asked recently to do an interesting little job that entailed recording an acoustic ensemble in front of a live audience, with instrumentation that comprised a celtic harp, a bass viol and a violin, with the harpist also handling the vocals. 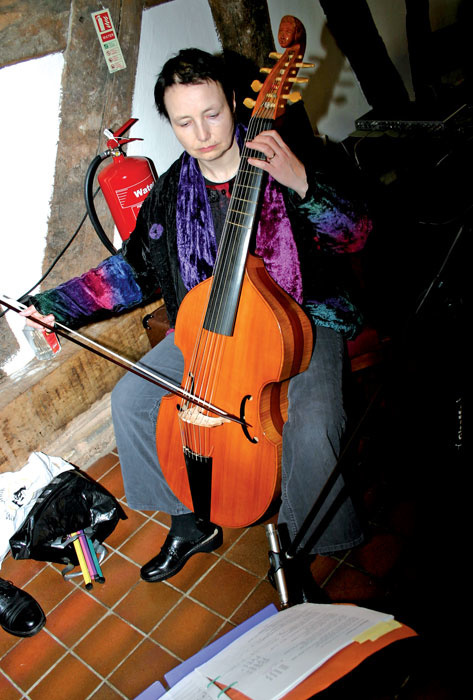 For those who don't know, the bass viol is a medieval instrument that looks not unlike a cello and is similarly played with a bow, though it is actually a closer relative of the guitar and, like that instrument, is fitted with frets. 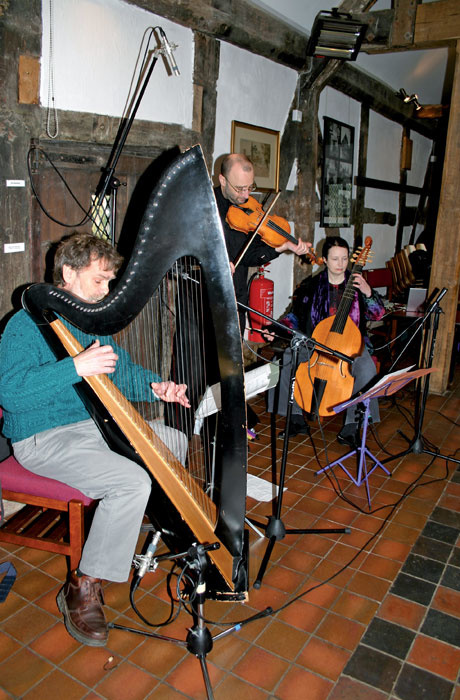 The venue was to be a small, ancient, timbered building with stone floors. The front row of the audience would be very close to the performers, which wouldn't leave me with a lot of flexibility when positioning the microphones, and ruled out the use of stands other than in the performance area itself. However, the quality needed to be as good as possible, as the band wanted to mix their recording back in the studio, possibly for use as a live CD. As I would later be mixing the project in Apple's Logic Pro on the desktop machine in my studio, I decided to record into Logic Express on my Macbook Pro, using a Focusrite Saffire Pro 26 as the interface. This particular interface has the benefit of eight very respectable mic amps with phantom power, and the whole thing can be powered from the Firewire socket of the laptop, making it a very compact and portable recording solution for this type of project. It also has a couple of ADAT expansion ports, allowing more channels to be added if necessary, using something like an Focusrite Octopre or other ADAT-compatible preamp unit. I arrived with plenty of time to set up and assembled my little workstation on a small table, off to one side of the performance area. The plan was to close-mic everything, and then to use a further stereo mic to capture some of the room ambience and audience reaction. As there was nowhere I could set up a stand for the room mic, I settled for resting it between a couple of ceiling timbers. As it was over to one side of centre the position was something of a compromise, but at least I'd stand a chance of getting something useful without the stand being kicked by members of the audience. As I already had an Audio Technica AT825 stereo microphone that I use with my Minidisc recorder, I opted to press this into service: it has always produced first-class results in the past and it didn't disappoint in this instance. 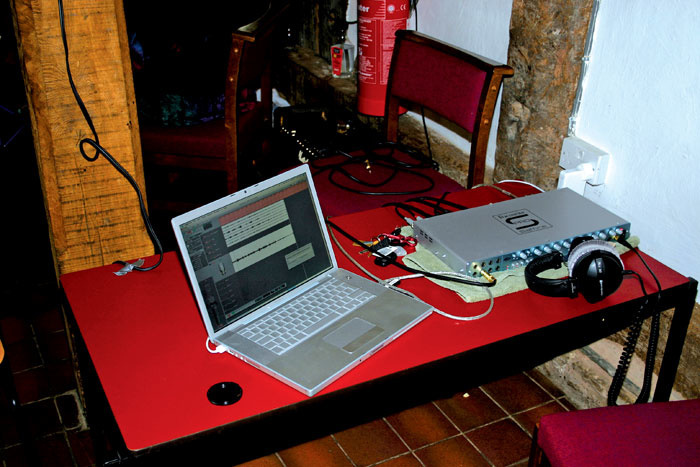 Small venues aren't always the most convenient places for the recording engineer! In this case, the laptop and Focusrite Saffire Pro 26 interface were set up to the side of the stage, and monitoring was done via headphones.I was concerned that a relatively quiet instrument such as the harp would be difficult to record with enough separation from the other instruments, but this turned out to be far less of a problem than I anticipated (in fact, the violin actually proved to be the most problematic instrument). 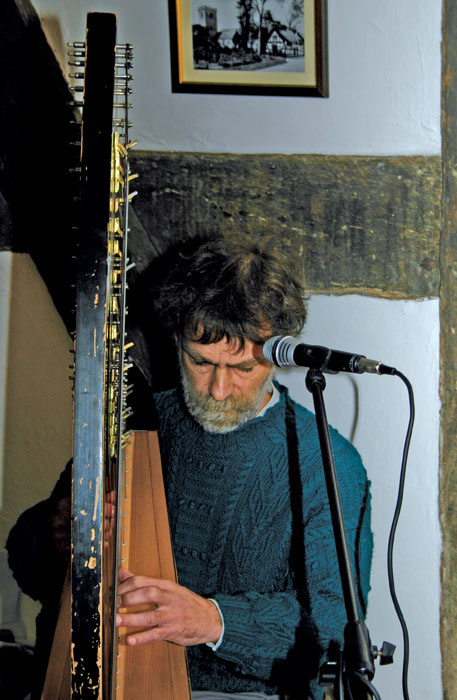 The lower section of the harp comprises the soundbox, and this has a soundhole pointing backwards towards the player. By setting up a cardioid capacitor mic (an SE3A) on a short stand, I was able to mic up the harp around six to eight inches from the soundhole, where the resulting tone was surprisingly faithful and the mic picked up negligible spill from the other instruments. One thing you have to be careful of in this situation is positioning the mic where the player isn't going to knock it with his or her foot during the performance. A separate capacitor mic was used for the vocal but, because there was no room to set up a pop shield without it spoiling the view for the audience, I chose the hand-held Beyerdynamic Opus 69 model (which is designed for live performance) and mounted it on a boom stand in a plastic mounting-clip. To further reduce the risk of popping, I set the mic up so that the singer sang under it rather than directly into it, which seemed to work perfectly well. For the violin, I used a Sontronics STC15 cardioid capacitor microphone on a tall boom stand, positioning the mic around two feet above the violin body and pointing down towards it. This configuration inevitably picks up some spill from the other instruments, but if you get the mic much closer, not only does the tone suffer but the level tends to vary to a noticeable degree as the player moves. Capturing some of the crowd noise for use in the mix, as well as some room ambience, posed a problem, as there was little space in which to put a large mic stand. 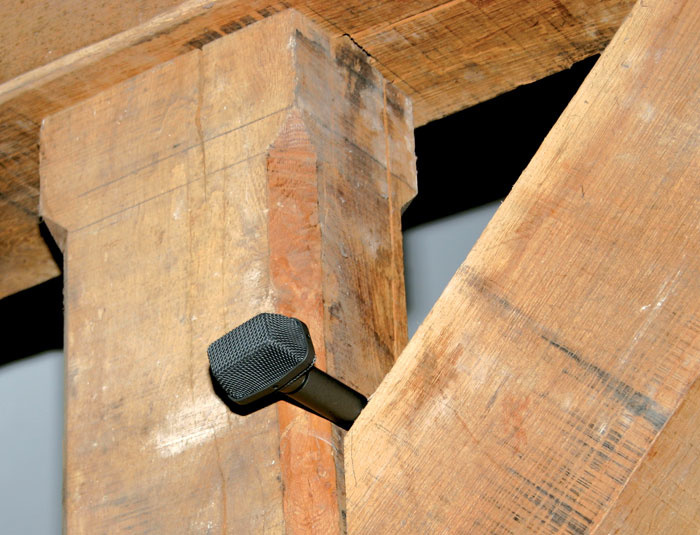 In the end, an improvised solution saw a stereo mic placed in a convenient space in the beams of the ancient venue!By contrast, because the viol is played from a seated position, it tends not to move so much, so I was able to get the mic a little closer in this case. Again, I chose an SE3A cardioid capacitor model and set it up around 12 inches from the soundboard.The close miking proved to be a necessity, because the viol isn't a particularly loud instrument. When setting the recording levels, I got the band to run through their loudest song and then adjusted the levels to leave around 10dB of headroom. As it turned out, there were brief periods of clipping during the applause between numbers but this didn't cause any audible problems. 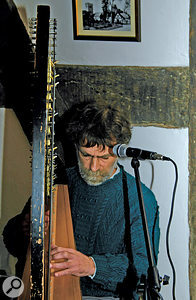 Prior to the start of the concert, Jonathan, the harpist and singer, asked the audience to keep as quiet as possible because the concert was being recorded, and he also suggested that if they saw fit to applaud, they wait until the music had died away completely. Luckily they did as they were asked, so we captured clean endings to all the songs. 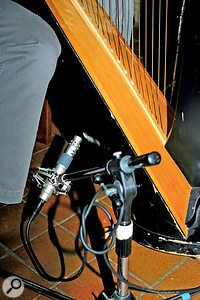 The harp mic was placed six to eight inches from the soundhole. This is quite low on the harp and it is important to place the mic where it won't easily get knocked by the performer's feet.Once the session was about to start, I hit record and then sat back to enjoy the show, keeping my eye on the meters — and monitoring the proceedings via headphones, of course. Each sequencer is different, and for Logic the maximum recording time is actually dictated by bars as well as hours and minutes, so once you make sure the maximum recording time set in Preferences is adequate (I set 90 minutes), it can be worth slowing the tempo down to make sure the bar limit isn't exceeded before the time limit. With an anticipated set of around 50 minutes, that wouldn't have been a problem here, but it is worth noting for projects that require very long recording times. After the session I checked the audio quality and, other than a couple of audible tea-cup clinks during the first number, it sounded surprisingly clean, with no obvious audience noise. The harp sounded wonderfully clear with no additional treatment, and the amount of spill was negligible. Similarly, the vocals had great separation, even from the harp, and there was no sign of popping or other problems. There was more spill on the viol track, but still plenty of leeway to get a good balance. The tone of the instrument was captured very nicely too. As I mentioned earlier, the violin was the most problematic instrument in terms of spill, simply because the mic was placed further away from it than in the case of the other instruments. Even so, there was enough separation to get the instrument to sit sensibly in the mix, and once I'd tried a little high-cut shelving EQ to smooth out the tonality, the separation improved further. A Beyerdynamic Opus 69 (a hand-held condenser) was used on the vocals. A pop shield doesn't look too nice on stage, so the mic was positioned such that the vocalist could sing under it rather than directly into it, reducing the need for a pop shield.I used very subtle panning to try to place the instruments roughly where they were on stage (though I kept the vocals in the centre) and then added in the stereo room mic. This actually provided a very positive contribution, despite being positioned off to one side of centre: the room itself sounded nicely live, without being over-reverberant, and adding in this mic sweetened the whole mix, as well as giving it a sense of space. As you'd expect, the natural balance of the instruments was fairly good because this was a completely unamplified performance, so the room mic heard pretty much what the audience heard. I also selected a small concert-room reverb (to match in with the acoustic of the actual room) and set it up to add to the close mics where necessary. I used Logic 's Space Designer for this, loading in the 1.4-second Recital Hall impulse response. Jonathan sat in on the mix, which turned out to be relatively straightforward. For his vocals, I applied some compression to tame the natural dynamics of the voice, but most of the time the compressor was only trimming 3 or 4dB off the top, with maybe as much as 8dB on particularly loud sections. His voice didn't need any EQ, but we did add a hint of the Space Designer reverb (about 20 percent) to take the dry edge off the close-mic'd sound. For the bass viol, I added a bit of warmth at around 200Hz, using a little EQ, but that's pretty much all it needed to make it sound right. However, I did add a little compression to tame some of the louder notes, in order to make balancing easier. Because of the spill from other sources, I also switched in low- and high-cut filters at around 40Hz and 6kHz respectively, to keep the sound as clean as possible. This didn't change the subjective sound significantly but did reduce the spill from the violin and harp. For the viol, an SE Electronics SE3A capacitor mic was used, set up around 12 inches from the soundboard.As pointed out earlier, the harp was recorded with good separation and a nice clean tone, so we just needed to tame the high end a touch, by dipping the EQ at around 4kHz to take away some of the artificial brightness that close-miking often causes. The worst spill was experienced by the violin mic so, rather than just sticking with the high-cut filter, I again bracketed the frequency spectrum with both low- and high-pass filters, this time at around 150Hz and 5kHz, with the EQ peaked up a little to emphasise frequencies at the cutoff point. This sweetened the high end nicely, while the low-cut filter reduced spill from the viol. I also used level automation to bring up both the viol and violin by two or three dB during instrumental passages, which sounded quite natural once the stereo overhead mic was in the mix. To clean up the overhead mic, I bracketed this at 75Hz and 6kHz using high-and low-pass shelving filters and also dipped out a little around 200Hz to clear up some boxy roominess. After that, it was just a matter of trimming up the starts of the tracks, fading the applause at the ends of the tracks, and then mixing. Because the applause was so loud relative to the music, I used a Waves L3 limiter to bring up the music level while pinning down the applause, so we were able to get a reasonable overall loudness. There will always be compromises when setting up for a gig recording such as this (remember the room mic in the roof timbers earlier!). You are also likely to get plenty of spill, no matter how hard you try to achieve good separation. But it is still perfectly possible to produce a good recording that will, with a little work on the mix, translate well to CD. Just remember that preparation is important, as you don't get a chance for another take: turn up with plenty of time to set up your equipment and to experiment with mic placement, and leave plenty of headroom to account for a more enthusiastic performance than the one given during the soundcheck! Once the individual tracks had been mixed, still as 24-bit, 44.1kHz files (just as they were recorded), I assembled a playlist in Roxio's Jam software, with a two-second gap between tracks, then burned an audio CD. One of the benefits of Jam is that it dithers to 16-bit as the last stage of processing, so that even if you change relative track levels within the Jam software, you still get the benefit of dithering at the end of the processing chain. Using Jam, selecting a different playing order is also a simple matter.